As it plays out with so many things in the marketplace, Easton Press books, once an automatic buy for booksellers at $5 or $10 - no matter what they were - no longer are. These days you have to pick your spots, carefully. There are several reasons for this, and certainly one of them is the downward trend in prices for commodity books generally. Yes, commodity books. Most Easton Press examples are commodity books, genuine leather bindings, silk moiré endpapers, etc., notwithstanding. For the most part, you could not say the same for the Franklin Press, the Folio Library, the Limited Editions Club or any of many similar publishers that have issued and in some cases continue to issue so-called fine bindings in limited quantities. What differentiates the Easton Press from these is that, with few backlist exceptions, there are no issue limitations. Many titles are issued and reissued and reissued to whatever extent the market will absorb them, often retreads in variant bindings, always undated - and what bibliographer would even attempt to make sense of it? There is a difference between antiquarian books, what you could call objets d'art, and shelf decoration, and the Easton Press merrily produces the latter almost exclusively. To be fair, Limited Editions are produced occasionally, some of them numbered and/or signed. But even these can give us pause because (especially recently) they seem to be gaming the system. 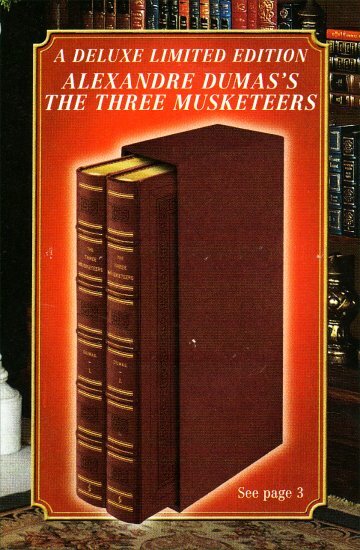 I'm looking at a recent catalog that features a two-volume slipcased edition of The Three Musketeers "Limited to just 400 hand-number copies!" No matter that Easton Press has been churning out this title in mega-quantities for decades as part of its 100 Greatest Books Ever Written series. 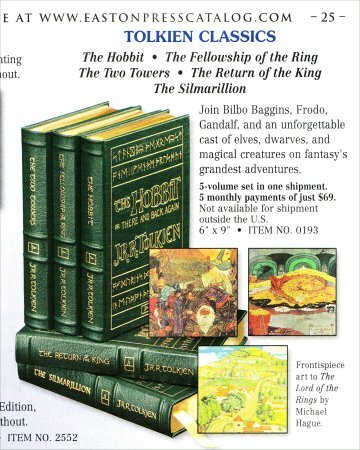 This is a limited edition, presumably because of its slipcase and a few alterations in binding and illustrative content. The privilege of owning it is yours for - choke - four easy payments of $125. I'm raising this issue because, if you're going to make any money selling Easton Press books, it will pay to be able to differentiate between Limited Editions that grow in value over time and those that don't. An example of some that will includes several titles in Easton's Library of Presidents series signed by dead presidents - Nixon, Ford and Reagan (though interest in Ford remains lukewarm). These are what you could call a forced limitation. No matter what, additional signed books by these three presidents cannot be produced, and values reflect this. 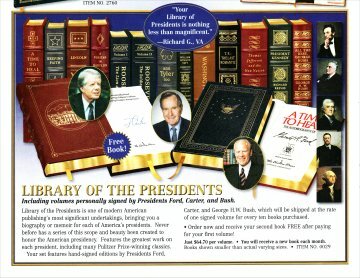 However, Easton does currently offer volumes in this series signed by living Presidents Bush and Carter. Perhaps when these two pass on values will increase some as well, but in Carter's case writer's cramp has certainly set in; he seems to have signed everything in sight, inside and outside this series, and everywhere else. It could be decades before anything significantly edges north. What's not helping this situation any - and this is decidedly true in my area - is that Easton Press books are now almost invariably priced higher at sales, often in the $15 to $30 and up range. Who knows why. Maybe liquidators are noticing that more booksellers are going after them - and of course there are more of them to go after. Anyway, given that many Easton's now struggle to get to $10 or $15 on eBay, I rarely buy them at sales unless I come across one of the more desirable titles. This series attempts to feature each President's greatest work, sometimes in multiple volumes, and, as noted above, to date there are five signed titles in this series, and living Presidents George W. Bush and Barack Obama could enter the game as well. Grab anything signed at the right price. Unsigned volumes have modest value overall ($20 to $30) with a few bumps north for the usual collected suspects - Grant, Lincoln, etc. Lots of meat on this series because the focus is on good authors books with durable value. A few notable authors include Ray Bradbury, Kurt Vonnegut, Hunter S. Thompson, etc., but don't grab everything. Of all the Easton series this is perhaps populated with the most lightweights - authors and titles - despite being signed first editions. A few exceptions include John Updike, Kurt Vonnegut, Carlos Casteneda, etc., but you're far more likely to encounter the likes of Barbara Bush, Garrison Keillor, Bob Scieffer - well, you get the idea, signed books that might not be worth throwing more than $5 or so at. Definitely pick your spots. This is a consistently strong series. I am tempted to say grab anything; if you do, you'll be right over 90% of the time. Many of SF's best and brightest populate this list - Asimov, Pohl, Norton and on and on. The focus here is on SF books that have become or are becoming classics - Dune, 2001: A Space Odyssey, Stranger in a Strange Land, etc. There are also some titles that aren't typically thought of as SF - 1984, Animal Farm, Tarzan of the Apes, etc., but again, it's hard to go wrong with this series. Much of it is worth grabbing, even though only a dozen or so are signed. You may have noticed the phenomenon of sets. On occasion they sell for more than the individual titles combined. It can take serious time to assemble, for example, the 100 Greatest Books Ever Written, and if money isn't an issue, some buyers will pay a premium for not having to assemble it. But many smaller sets tend to do well too. When you encounter one, say, a set of Tolkien's, seriously consider it. In a sense, this is at once easy and difficult. It's easy in that one could make the following blanket statement - virtually anything that is hotly collectible as a trade edition will be sought after as an Easton reprint. This is difficult, however, in the sense that you need to know your stuff. Obvious examples include any Ayn Rand, Ernest Hemingway, or Oz title, etc., but did you know that Nelson Mandela's signed Long Walk to Freedom often sells for $1,000, $2,000 and up? Exceptions to this rule - at least to a large extent - are many of the older classics, especially fiction, and often titles in the following series: 100 Greatest Books Ever Written, Great Books of the 20th Century and Books That Changed the World. Books in these series are also the most frequently encountered. A final note on condition. It's always important in bookselling, but with Easton's, it's hyper-important. Any visible defects whatsoever - a few of the more common ones include rubbed gilt on the stamped bindings, scratching or speckling on the gilt text block edges, and bookplates mounted on the silk moiré endpapers - will affect values. Take special care to buy the best copies possible. Next time I'll discuss how to market Easton's.